It's been 10 days of John McCain's death and the former U.S. senator was laid to rest on a green hill beside the Severn River at the US Naval Academy in Annapolis, Maryland; he was buried next to the grave of his childhood friend Charles “Chuck” Larson on Sunday, September 2. Larson, who was a U.S. Navy Adm, had passed away at his Annapolis home on July 26, 2014; as for the cause of death, he died of pneumonia, after being afflicted with leukemia for two years. The Vietnam War hero's final resting place is the cemetery near the fields and classrooms where he and Larson met as young men six decades ago. John, who was a maverick senator and a two-time presidential candidate, was bid farewell in a private ceremony by his closest friends and family members, along with military dignitaries and his academy Class members of 1958. The late Arizona senator’s father and grandfather (both were admirals) are also buried at the Naval Academy cemetery. Before the burial, John's wife Cindy McCain, their sons Jack McCain and Don McCain, daughter Meghan McCain and his mother, Roberta McCain, 106, joined mourners at a memorial service at the academy’s chapel. John had died on August 25 at his Arizona home after a long battle with brain cancer. Shortly after John's passing, his daughter Meghan, who is a host of The View, shared a personal letter to fans on Instagram to express how wonderful of a father John was. 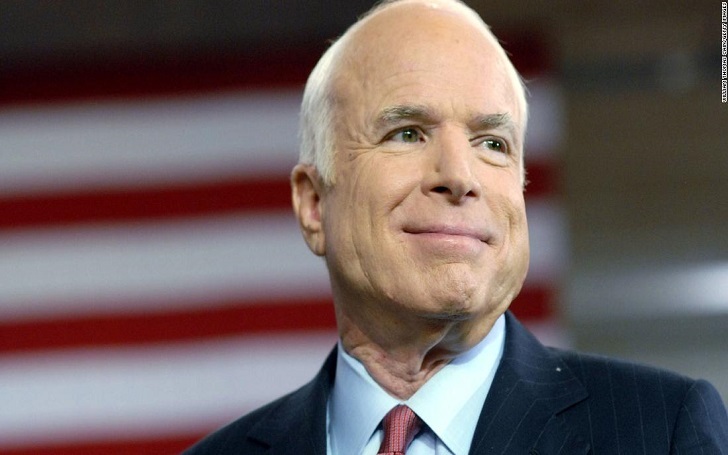 John had been diagnosed with a cancerous brain tumor, the McCain family had revealed on in July 2017. Later in December 2017, he was hospitalized for cancer treatment because of the side effects related to his cancer therapy.